No good BBQ is complete without a yummy corn muffin. 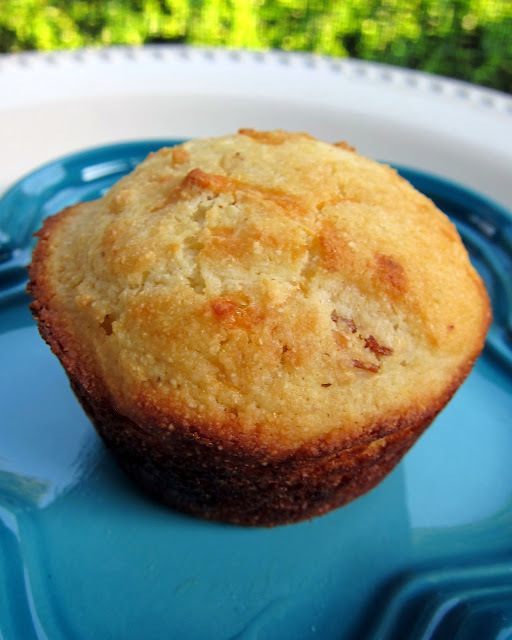 These corn muffins are not your ordinary corn muffin; they are over the top - packed full of cheddar cheese and bacon! YUM! I had a small concern about this recipe because it has sugar in it. In my house, cornbread is not suppose to be sweet. I decided to go with it since it was only a tablespoon. The muffins turned out great. They weren't sweet and we both loved the cheddar and bacon. They were especially good with a big ol' dollop of honey butter! Heat 12-cup muffin pan in oven 5 minutes. Combine cornmeal mix and sugar in a medium bowl. Stir in buttermilk and egg; stirring just until dry ingredients are moistened. Stir in melted butter, cheese, and bacon. Remove pan from oven, and coat with cooking spray. Spoon batter into hot muffin pan, filling almost completely full. Bake for15 to 20 minutes or until golden. I'd say they went over the top! These look delicious! I like to add sharp cheddar and green chiles to my cornbread but haven't added bacon before. I'll definitely give these a try. I am unfamiliar with self-rising cornmeal - have to go check out the grocery store now! Looks awesome, but I expected to see bacon in the cross-section photo. My wife and I love bacon, cheese, and cornbread. This is a great way to get all three. these sound so good and my daughter loves bacon I can't wait to surprise her. These were sooooooo good! I just made them and linked up to your blog! Thanks!